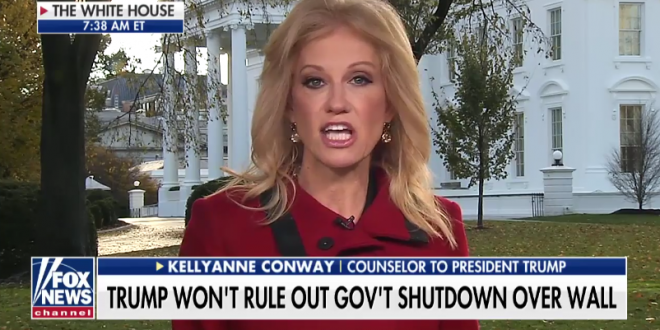 Kellyanne Conway: Trump Might Shutdown Government Over Border Wall Funding, All Options Open [VIDEO] - Joe.My.God. White House counselor Kellyanne Conway on Friday said “all options are open” in response to a question about President Trump potentially shutting down the government over funding for the border wall. “Fox & Friends” host Steve Doocy said that “it doesn’t look he’s going to get funding for the wall” in the upcoming spending bill and asked Conway if there will be a government shutdown in response. On Fox News, @KellyannePolls says Trump is leaving open possibility of shutting down government next month if he doesn’t get $1.6 billion for his border wall.